How long has it been since your last damn trim? For the hirsute or the hirsute at heart. Hello, this is the GEICO caveman calling…I’d like to make an appointment with my stylist? I need a new look to snag a new gig as soon as I can. Seems the company found some cute little hairless lizard to replace me with. Oh, you CAN see me today? GREAT! The last time i went for a free spa, Muhammed Ali came out and punched me several times. Hangout for rich Greek billionaires in Speedos…. Any realtion to Dirty Hairy? It’s a real jungle in here! beechoak: clever comment, and I’m glad it’s only the rich Greek billionaires, not the poor Greek billionaires. Get your hands off me, you damn hairy ape! 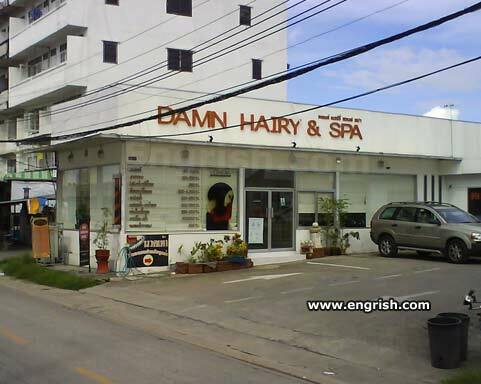 A relaxing retreat for your follicle follies. I can’t remember. Is that the ex’s favourite esthetician or the legal firm she sicced onto me? Can I get a friggin’ moustache trim with that? I hear they are frequented by both Sasquatch and Yeti. YUGAN: Yeah, I noticed the redundancy after I clicked the submit button. I wish we could go back and edit when we discover a mistake in our comments. Why does this manicure set have a corkscrew and a bottle opener??? Gush! He’s damn sweaty too!! Yuganh & Beechoak. If you asked a Greek billionaire he may well reckon he was poor, if he had no sons. All right, Boo-Boo, it’s time for a trim and massage at the doggie spa. C’mon, Bigfoot, I know that you hate a haircut, but you’re so damn hairy! You like the massage, remember? Chewbacca has been dragged here time and again, shrieking. Bring earplugs when it’s time to wax; you can hear ’em screaming from two miles away. I dated one girl that could use a trip to this place. Damn them Turkish girls are hairy down there. the last five letters, C-I-O-U-S, fell off during a storm. @3DOMan: I can imagine that there are plenty of women making similar complaints about men. I like my men hairy, but not damn hairy!